Hamas official: Morsi's victory could enable Hamas to secure international recognition. We still won't recognize Israel, however. The victory of Mohammed Morsi in the Egyptian presidential elections could enable Hamas to secure international recognition, an official in the party told the Bethlehem-based Ma’an news agency on Monday. Ahmad Yousef, who is regarded as a Hamas moderate, told Ma'an that the Morsi presidency could help end the West's isolation of the movement, as well as ending Israel's blockade on Gaza. He noted that the movement would accept any condition from the international community in exchange for international recognition except one: recognizing Israel. He claimed that a Hamas recognition of Israel means giving up rights. “I am confident that the West will deal with Hamas and remove the movement from the terrorism list, because for four years Hamas has started to show moderation and flexibility,” Yousef said, adding that Hamas is ready to take Egypt's advice, and to accept any reconciliation deal it brokers with the rival Fatah party. 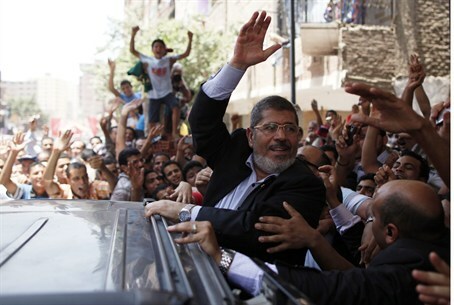 Hamas wildly cheered Egypt’s Muslim Brotherhood victory in the presidential election on Sunday, welcoming Morsi’s election with the usual gunfire. The Muslim Brotherhood helped found Hamas in 1987. On Monday, the Iranian Fars news agency published an interview with Morsi in which he said he will “reconsider the Camp David Accord” with Israel. He also said that he wants closer ties with Tehran to create a “balance” in the Middle East. The Egyptian presidency later denied that Morsi gave an interview to Fars, saying that “everything that this agency has published is without foundation.” It was suggest that the news agency simply fabricated the interview with Morsi. Meanwhile, a Fatah adviser played down Hamas’ confidence after the Morsi victory, saying it was misplaced.